Forty minutes of expert level pinball, that is, from the deciding game at this month's Professional/Amateur Pinball Association World Pinball Championships. If you've got a thirst for pinball and the better part of an hour to spare, watch. Keep in mind that there's $10,000 on the line during this extended pinball session. 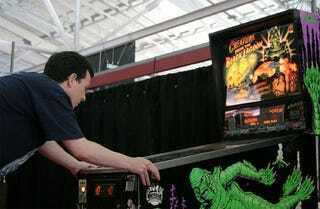 But repeat PAPA pinball champ Keith Elwin makes it look relatively easy, thanks to carefully calculated shots and professional level precision. All that flipper filled action was captured by overhead cameras that provide an excellent view of the playfield. The silver ball enthusiasts at Tilt Warning provide an excellent recount of the final showdown, which any pinball aficionado should find worthwhile. Oh, the game is Creature From the Black Lagoon, by the way, a table released by Bally in 1992.